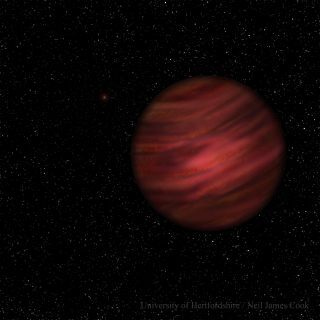 An artist's impression of 2MASS J2126, which orbits 7,000 times farther from its star than Earth does from the sun. Astronomers have found the parent star for a gas-giant exoplanet named 2MASS J2126, which was previously thought to be a "rogue" world flying freely through space. The planet and its star are separated by about 7,000 astronomical units (AU), meaning the alien world completes one orbit every 900,000 years or so, researchers said. (One AU is the average distance from Earth to the sun — about 93 million miles, or 150 million km). Deacon and his colleagues analyzed databases of rogue planets, young stars and brown dwarfs — strange objects bigger than planets, but too small to ignite the internal fusion reactions that power stars — to see if they could link any of them together. Knowledge of the planet's age allowed the researchers to calculate a mass for the planet: about 12 to 15 times that of Jupiter. Previous studies had estimated 2MASS J2126's temperature to be about 2,730 degrees Fahrenheit (1,500 degrees Celsius). The planet appears to be broadly similar in these characteristics to the alien world Beta Pictoris b — but 2MASS J2126 orbits more than 700 times farther from its star than Beta Pictoris b does, team members said.